Please allow for a continutied dip into the pool of sticker insanity. 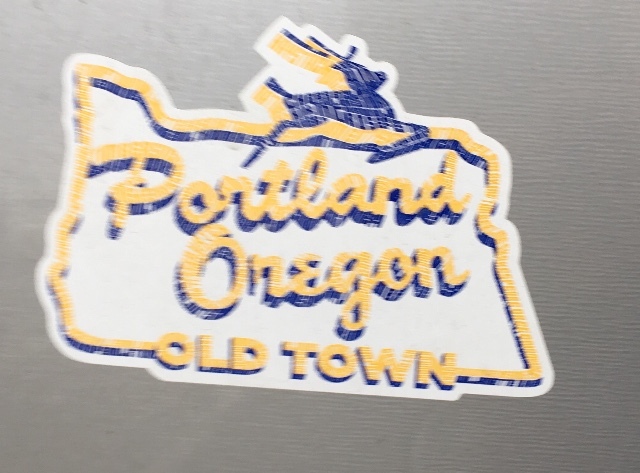 We’ll get back to our regular scheduled blog posting soon but at this point we’re stuck, (brilliant pun acknowledged) in the world of Oregon Decals, not that I know the difference between decals and stickers. For the most part these seem to end up on the rear windows of people’s cars and not on the back of traffic signs. 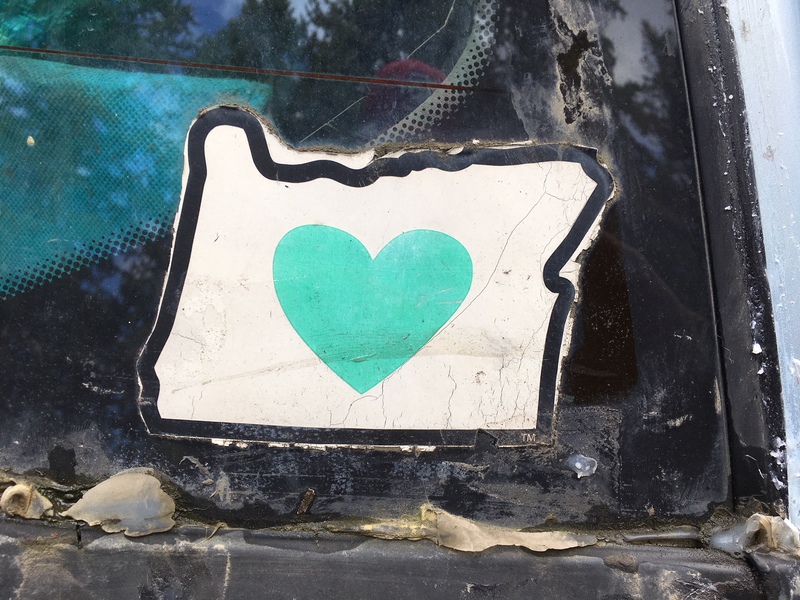 This being the third installment of this series, I have to reiterate that my interest in the stickers is the homage to the Grand Daddy of all them all, the green heart with a white background surrounded by the state border. Until I am proven wrong I will always believe these stickers are making a homage to this idea, or is it outright theft? The designs continue to cropping up in inventive ways inspiring my need to collect these images. 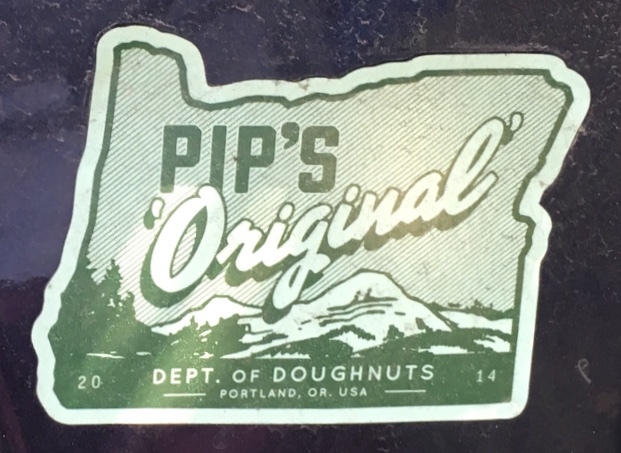 Everything that’s special about Oregon or Portland seems to be announcing itself within the state’s outline. Most of these stickers could have considered a different design. I am insinuating that decal designers might be on the lazy side. In the end, it’s okay because of the local and state angle begs for border usage. As luck has it, the Oregon border is more interesting than other geometric shapes that could be considered for framing. The internet can make it easy to solve the mystery of what Attis is. It takes two seconds but I procrastinate and still don’t know what an Attis is. 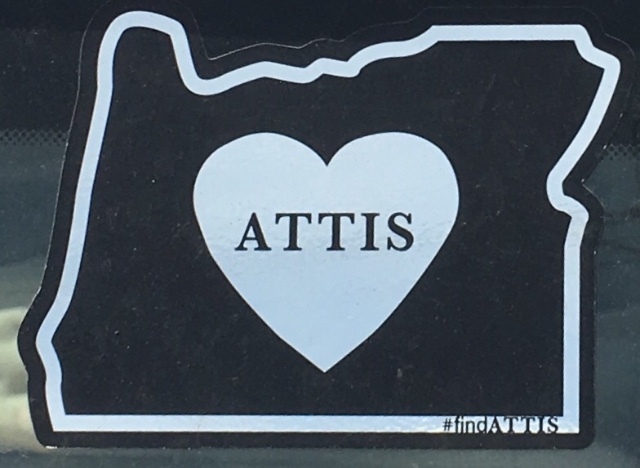 This inverse use of the heart in Oregon design, white on a black border instead of green on white is a novel approach and Attis is where the heart is. 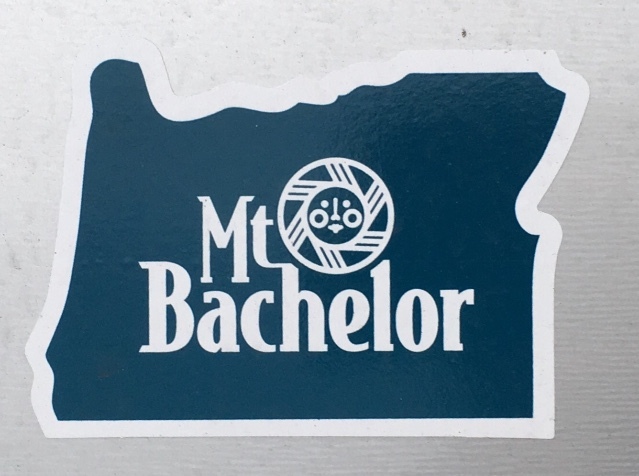 In my guesstimation, Mt Bachelor resides close to the middle of the state, or not. The sunny 70’s style logo and loopy, conjoined font, refer to the mountain that would then be appropriately centered in this state bordered design. 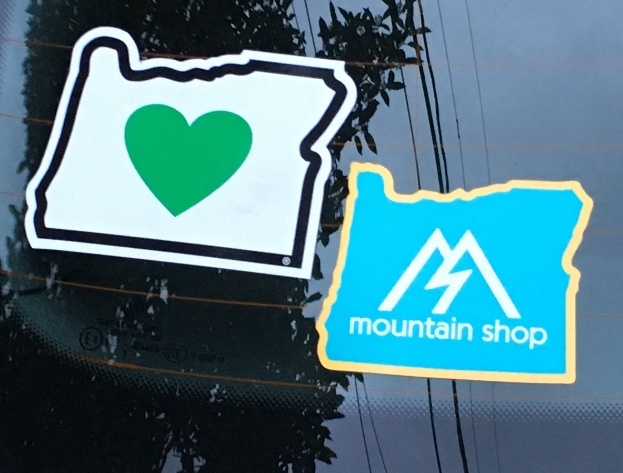 It’s a pleasant thought to consider Oregon mountains having their own PR departments. Of course the reindeer, or stag, to be more specific, is making an effort to leap out of the sticker. This design captures the look of our iconic sign. I can’t tell if the sticker has an aged feel that puts the old in Old Town or if the effect is coming from my bad photography. Here’s where I’m thrown for a loop even before I get loopy writing all this. 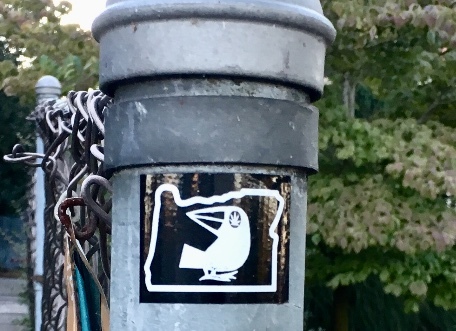 I will say this is a fun design but I’m not sure if it’s trying to promote a type of bird that lives in the area because I don’t know enough about the region’s birds or if this is a cartoon bird. The leafy eyes seem to point to the latter. Then again, this may be the state bird. The research department is not returning my calls. This design is just plain nice, like an old State Park poster. The color is serene and the images are scenic and rustic. It’s hard to imagine a sticker that could transport me into the world of a winter’s afternoon wilderness but this one has that effect. These folks do unique things with donuts so why should I expect anything less of their decal design. A sticker like this, on a beat up bumper, seems ironic enough. I knew the message well enough to disregard the duct tape covering the first word “Die.” Then I started wondering if the tape was intentional. The sticker now reads like an embracement of the moniker. You are the label you adhere to. 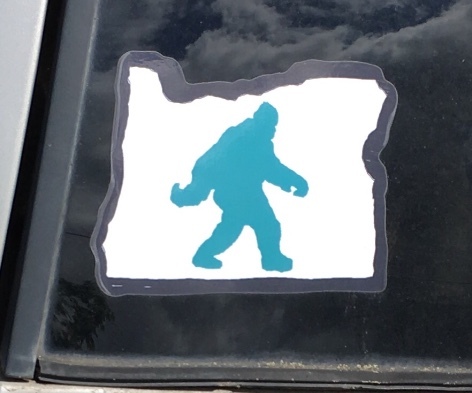 I’m big enough of a Bigfoot believer to consider that there has to be at least a few of these creatures running around the backwoods of Oregon making this decal honoring them all the more spot on. This is one intense sticker. 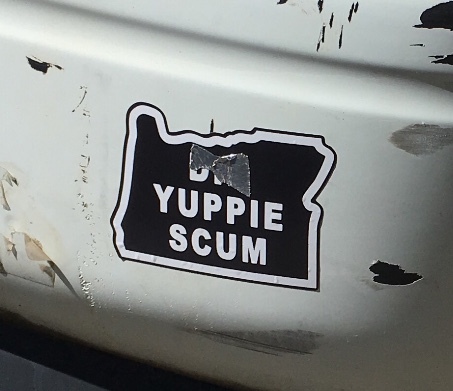 It image has little to do with Oregon but it does capture the vibe I sometimes get from the state. 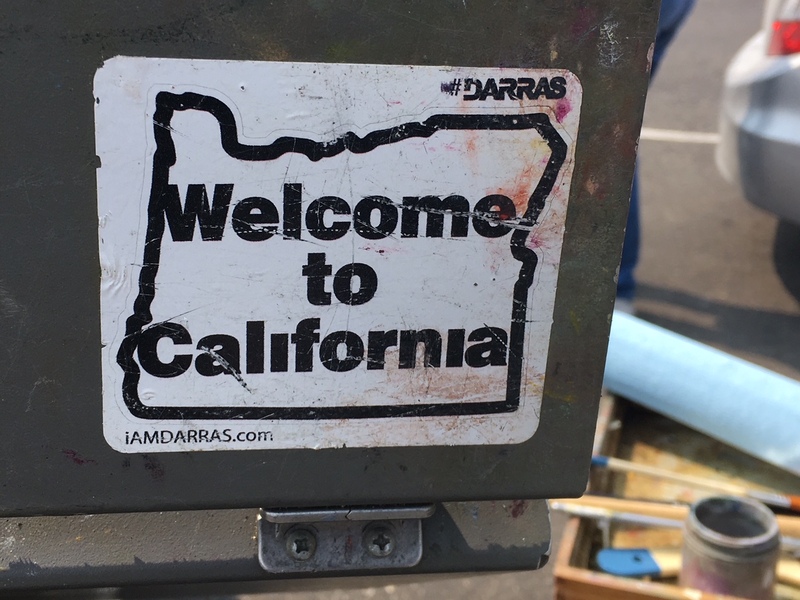 The reason for using the border design escapes me, but let me tell you it’s a free country and if you want to make a scary monster face shaped state of Oregon decal and put it on the back of a traffic sign, well, you go right ahead and do that. The charm and a cutesy message of this sticker are not lost on me and neither is its wandering border. It offers hope to all wanderers. 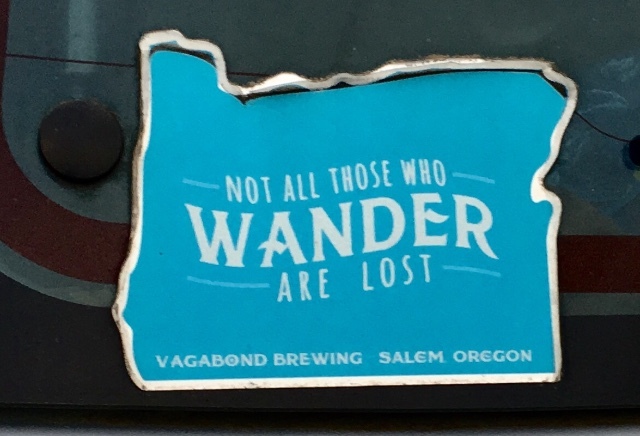 It’s a subtle beer sales tactic or maybe not so subtle given that the brewery’s name is Vagabond. If you have homes all over the state you need this sticker. I know, this design points out how at home people feel in Oregon. I could go on and on with theories about what’s being said here with each theory becoming more farfetched then the next but I’ll just give this sticker props for its use of a distinctive, skinny font on a verdant background. Home is where the heart should be. Sports team insignia? Tribal affiliation? I’m not familiar with the image that pops out from the red background. I would have spent weeks tweaking the angle. Here I can’t tell if the hawk is flying or if it really should be sitting up, ready to fly off toward its prey. Maybe it’s just me considering the use of all that space the state outline offers. 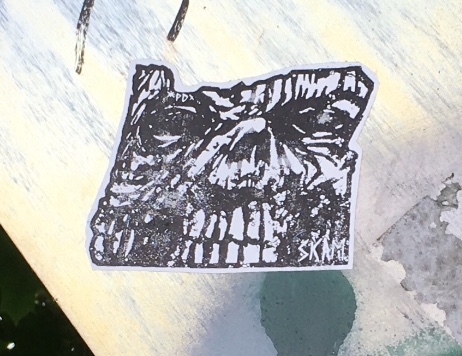 This mysterious bird leaped off a totem pole and is now soaring through this sticker. 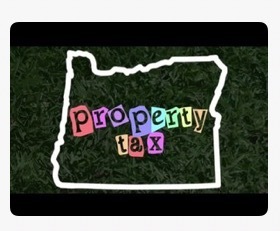 While I like the colors used to create the property tax message and the hostage communique lettering, it’s sad to say that I can’t tell if the design is pro or con on the property tax issue. This one screams out to have a Portland city boundary around it because the rest of the state seems wary of rising property taxes. Out in the Gorge last summer, I spotted this on the back of the laptop of an artist painting a landscape of the fantastic view from Crown Point. 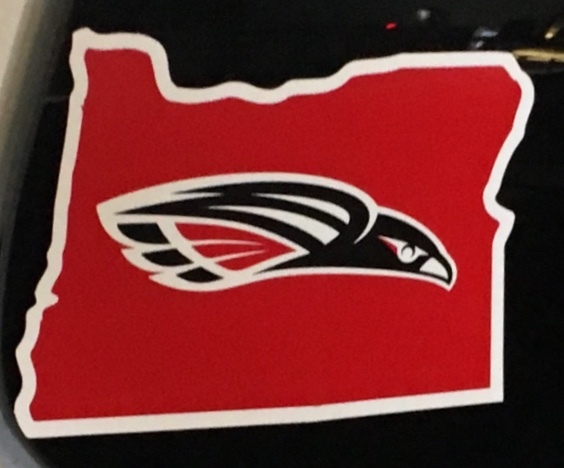 We had a bit of a laugh and while it’s not exactly true I appreciate any attempt at humor on an Oregon decal. 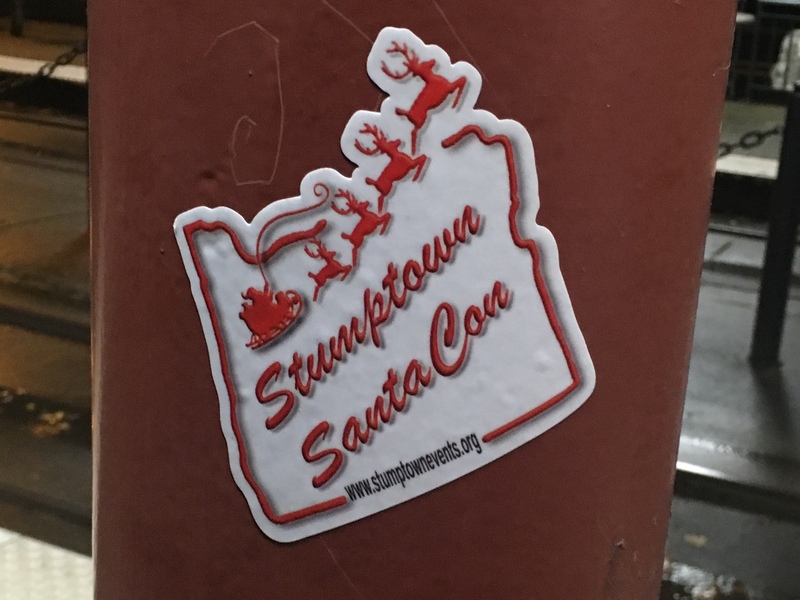 A great event such as SantaCon deserves its own sticker. The design gets bonus points for “coloring outside the lines.” Like the Old Town sticker reindeer-like creatures are doggedly determined to jump out of decals. 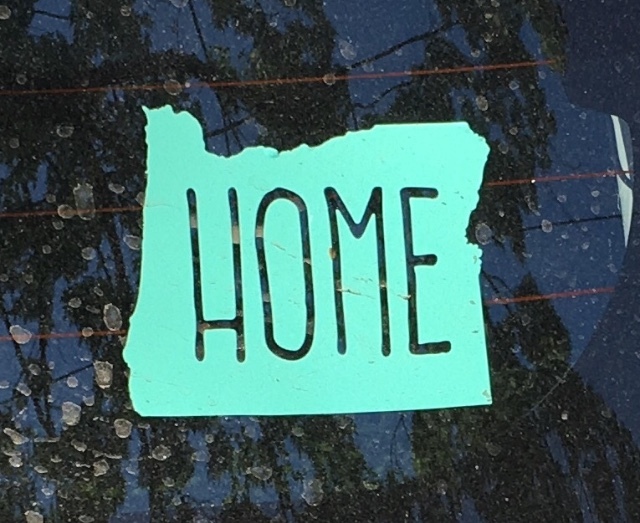 This sticker can’t encourage enough people to relocate to Oregon and live in a steel box condo. With the promise of giant trees everywhere, people will expect them in areas of the state where they actually aren’t. No one will be able to resist a state full of beautiful trees. 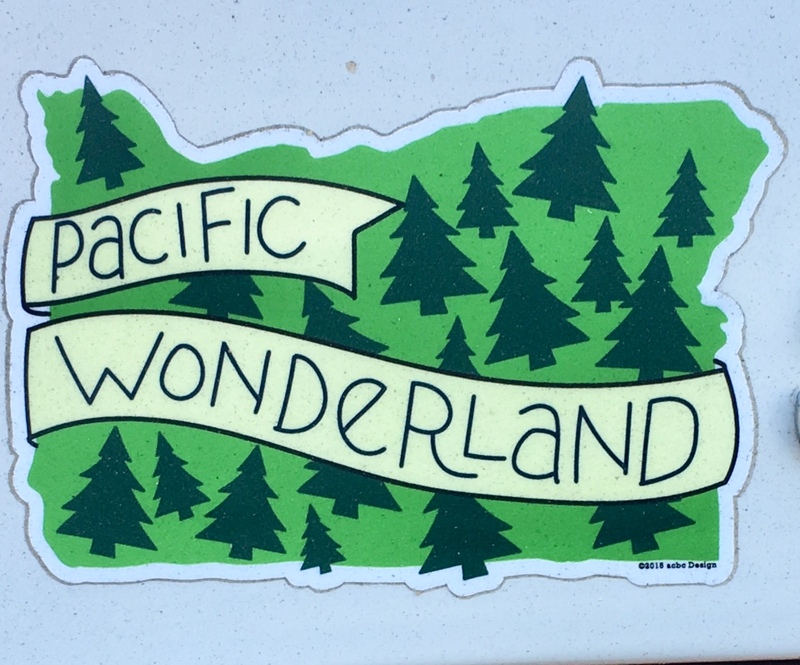 I’m not sure why this sticker revels in a falsely advertised version of wonderland but I already fell for it.